Having spent time at #1 on multiple bestseller lists, the first collection of short fiction from Dan Buri, Pieces Like Pottery, announces the arrival of a new American author. 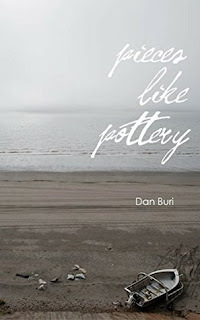 In this distinct selection of stories marked by struggle and compassion, Pieces Like Pottery is a powerful examination of the sorrows of life, the strength of character, the steadfaFilled with graceful insight into the human condition, each linked story presents a tale of loss and love. In Expect Dragons, James Hinri learns that his old high school teacher is dying. Wanting to tell Mr. Smith one last time how much his teaching impacted him, James drives across the country revisiting past encounters with his father's rejection and the pain of his youth. Disillusioned and losing hope, little did James know that Mr. Smith had one final lesson for him. This book took me forever to read, not because it's a bad book but because it is an extremely heavy book. The topics that are covered are all quite deep and challenge the reader. The stories were absolutely beautiful and Buri had a way of writing so the effect of the story got through to you but didn't overwhelm you. It delt with many different hard subjects; alcoholism, catholic priest scandals, depression, anxiety, losing a son. In conclusion, this book is definitely worth the read but it is probably better to read a story between a book rather then the whole thing at once. I'm giving this book 4/5 stars.